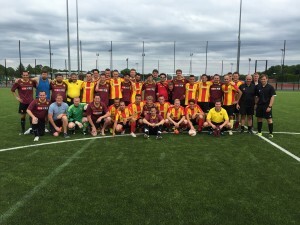 WIFC made it to the Quarter-Finals of the WorldNET Cup at the weekend, as the Internet ‘Orns made their long awaited return to the open age version of the end of season IFA tournament. Having travelled to Preston with a 16 man squad, including a last minute loan of goalkeepers Lewis Duxbury and Neil Crossley from Bury A, expectations of qualifying from a tough looking group were not high. The first half against London Cup holders Stevenage quickly dispelled any lowly ambitions as WIFC raced to a 2-0 lead against their Herts neighbours. Goals from Tommy Twelves and Dave Soloway got the weekend’s football off to a flier. The second game was a tighter affair. With both sides wary of Lens’ electric start to the group, defeat could have been costly. In a game of few chances WIFC were dealt a blow as centre half Ally Hill was red carded for a bit of industrial language aimed at the referee, but the Internet ‘Orns defended well to hold on for a hard earned 0-0 draw and valuable point. 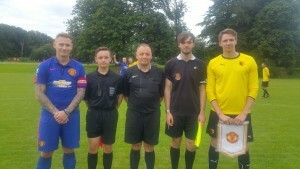 Captain Stu Nicholls lines up with his Manchester United counterpart, along with the targets of Ally Hill’s potty mouth..
Next up was, on paper, the toughest match against the mercurial French team RC Lens, twice winners of the event. With Hill suspended, management duo Moz Clarke and Chris Davis employed a christmas tree formation and Lens struggled to break down a resolute WIFC. Tommy Twelves opened the scoring before Lens equalised with one of their few chances. However, a scorching left foot volley from just outside the area by Connor Church with the last kick of the match earned a memorable 2-1 win in the two team’s long awaited first ever meeting. WIFC and Lens finally meet on the pitch..
A win in the last game against 2013 & 14 winners Halifax would see WIFC top the group. Having lost all three matches heavily in uncharacteristic fashion, the Yorkshire side were in no mood to end the day empty handed and with WIFC possibly still having half a mind on the events of the Lens game, Halifax won 2-1 despite a 3rd goal in 4 games from Tommy Twelves. The defeat did not prove too costly. Finishing with one of the best records of the second placed teams in each group, WIFC were seeded for the Sunday draw, meaning they would avoid the various group winners. A tie with Sheffield United kicked off the Sunday action and WIFC produced a dominant 30 minutes. A host of chances went begging and the Golden Boys should have had more than just a Ross Connor goal to show for their efforts. For just the 4th time in WIFC’s history, the Quarter-Finals of WorldNET had been reached and a first ever meeting with Runcorn Linnets awaited. With injuries starting to mount and an opposition packed with younger players, a brave and determined display from WIFC saw scores level at 0-0 after 30 minutes. Chances came and went for both sides in the extra time period, meaning penalties would decide who would face Preston in the semi-final. It wasn’t to be, as misses from Tommy Twelves and Connor Church handed a 4-2 win to the young Runcorn side. Despite that disappointment, the team were able to leave with heads held high and with a renewed enthusiasm for the open age WorldNET tournament. Most importantly, the social side of the club was as strong as ever as new friendships were cemented during a typically liquid-based Saturday evening. The two WorldNET 2017 tournaments can’t come quickly enough. Lewis Duxbury, Neil Crossley, Matt Ainsley, Phil McBride, Ben Pegram, Ben Smith, Dan Butterick, Ally Hill, Stuart Nicholls (C), Ben Kelly, Ross Connor, Connor Church, Dave Soloway, Ben Sheldon, Tommy Twelves, Liam McGarry. WIFC make their eagerly awaited return to the open-age WorldNET tournament, with their first trip to the IFA’s blue riband event since 2012 this weekend. While the Vets team has flown the Internet ‘Orns flag at the Big Tam Vets tournament in the interim years, returning to the main draw has been on the club’s agenda for the last two years. With the tournament having moved to Preston, a new experience awaits the 16 man squad. 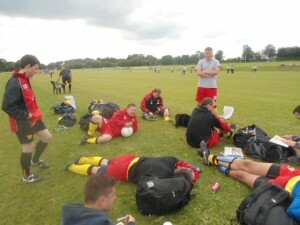 In a shot that echoes through the years, WIFC regroup between matches at WorldNET 2012. The draw has placed WIFC in a tough group for their return, with previous WorldNET winners Halifax and RC Lens joined by this season’s London Cup winners Stevenage and a competitive Manchester United side. With the first group match kicking off at 12, all eyes will be on WIFC as they attempt to improve on a round of 16 outing in their last trip to the main WorldNET. Equally as important as the football itself, WIFC have always maintained a healthy tradition of enjoying a good night out after the Saturday group games. Some memorable moments down the years are sure to be added to during the trip. 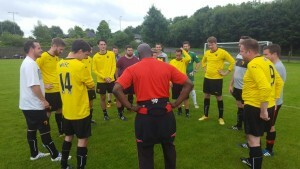 You can follow the team’s progress by following @watford_ifc on twitter.